Higher calling: Nigerian priest Fr Anthony Ekpo, who spent eight years in Australia as a seminarian and priest, has now been called to serve in the Secretariat of State. 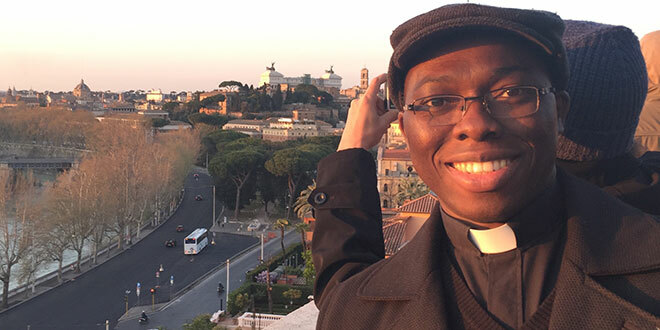 NIGERIAN priest Fr Anthony Ekpo, who was sent to serve the Brisbane archdiocese in a life-changing agreement ten years ago, has been called to work alongside Pope Francis in Vatican City. Fr Anthony Ekpo, who was 25 when he arrived in Brisbane on February 9, 2007, has been appointed to work in the General Affairs English section of the Secretaries of State. The section deals with the daily affairs and service of the Holy Father in Rome. It is the same section that Brisbane Archbishop Mark Coleridge, whom Fr Ekpo worked for as personal secretary, served between 1997 and 2002. Speaking to The Catholic Leader in Piacenza, northern Italy, following his appointment, Fr Ekpo said the offer to serve the Pope in the Secretariat of State “came out of the blue”. “My bishop (Bishop Lucius Ugorji) rang me and said, ‘You’ve been asked to work in the Vatican Secretariat of State’,” Fr Ekpo said. While still learning the particulars of his new appointment, Fr Ekpo said the role would be an opportunity to work at the universal level of the Church. Fr Ekpo was among a group of four Nigerian seminarians sent to Australia as part of an historic agreement between the Brisbane archdiocese and the Umuahia diocese, Nigeria. It was his first time leaving Nigeria, and has publicly admitted to thinking he was being sent to Austria. “And I couldn’t bare the thought of learning German,” Fr Ekpo said. Now, ten years later, Fr Ekpo can speak Italian alongside his native languages, English and Igbo. “I’m in a parish at the moment in Piacenza, in Northern Italy, called San Giuseppe Operaio (St Joseph the Worker),” Fr Ekpo said. “I’ve been here for nearly two months now, improving my Italian fluency. The recent appointment to serve Pope Francis in Vatican City brought up a similar response Fr Ekpo had following his Bishop’s request to send him to Brisbane. “It’s just like me living in Brisbane, it came at a time when I didn’t expect it, and then now this,” Fr Ekpo said. “When I look at my life there’s been so many changes within a short space of time but the thing is, as Archbishop Mark has said in the past, the God that leaves you where you are, is not the true God.